Bad weather, including fog and heavy snow, has hampered rescue efforts. Emergency teams have had to travel to the crash site by land rather than using a helicopter. Passengers' relatives have gathered at a mosque near Tehran's Mehrabad airport, according to Reuters news agency. "I can't bring myself to believe it," said one woman whose husband was on board. One man told Tabnak news website that he had missed the flight. Showing an unused ticket as proof, he said: "God has been really kind to me but I am so sad from the bottom of my heart for all those dear ones who lost their lives." Iran's President Hassan Rouhani expressed sympathy for all involved, saying, in a statement, that the incident brought "great grief and sorrow". Aseman, Iran's third largest airline, signed a contract with Boeing last year to buy 30 of its latest medium-range 737s. 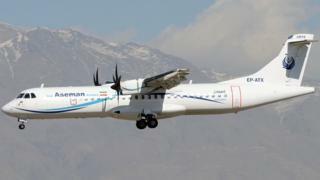 The crashed plane, a French-Italian-made ATR 72-500, was 25 years old, Iran's civil aviation organisation said. Iran's Supreme Leader, Ayatollah Ali Khamenei, has also expressed "deep sympathy" for relatives of those on board, saying the accident "saddened the hearts".